How Do I Find My Libsyn RSS and Track Links? Thank you for purchasing the Smart Podcast Player. This video is for Libsyn users. In this video, we’ll show you how to find the URLs you will need for both the Smart Podcast Player and the Smart Track Player. For the Smart Podcast Player, you will need to know your podcast’s RSS feed URL. In the left-hand menu, click on PowerPress. Go to the tabs across the top, and click on Feeds. Scroll down to “Podcast Feeds” and you’ll find your podcast feed here. If you set up more than one podcast in your PowerPress installation, click on “Category Podcasting” in the PowerPress menu. You'll find your separate category podcasts here. Copy the link for the show you want. 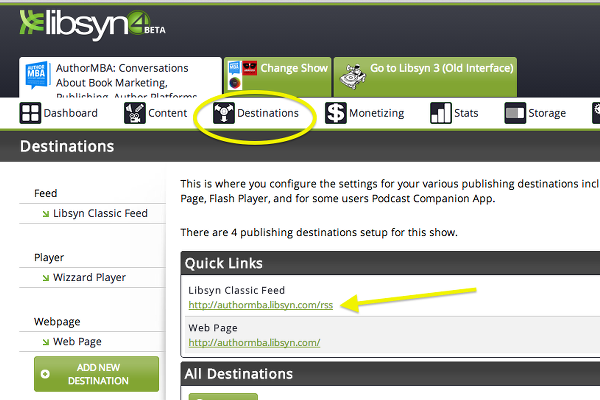 If you don't remember doing anything special to set up your podcast feed, you're probably using Libsyn's Classic Feed. In the Quick Links section, you’ll see your Libsyn Classic Feed. Now you have your podcast RSS feed. Finding an individual track link is much simpler. These steps will help you find the individual track link for the Smart Track Player. You're looking for the link that ends in .MP3. Go to Content --> Previously Published. Here you will find all of your posts. Find the episode you want to share and click on the links button. This will open up a box with several links. You want the “Direct Download URL,” which ends in .MP3.